Dont box me in: Christian Bale (l.) and Mark Wahlberg star in The Fighter. 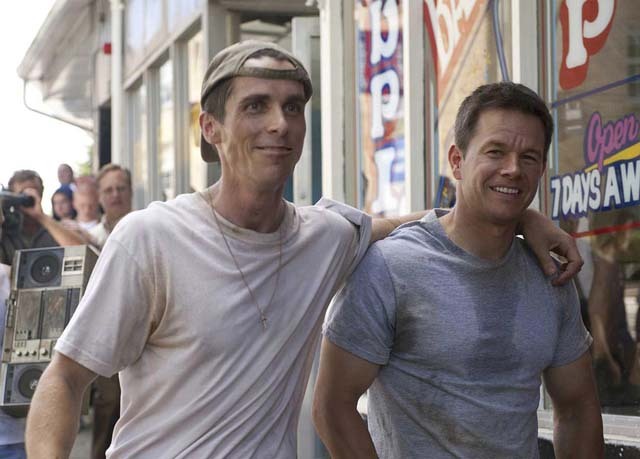 David O. Russell’s The Fighter, which picked up a pair of Oscars in 2011 for Best Supporting Actor and Actress (Terminator Salvation‘s Christian Bale and Conviction‘s Melissa Leo), is a solid boxing movie that embraces the mandates of the genre while successfully exploring other unique and personal avenues that make it a far richer work that it would have been otherwise. Based on a true story, The Fighter focuses on two brothers in the working class town of Lowell, Mass. : Boxer Micky Eklund (Mark Wahlberg, The Other Guys), a scrapper looking for a title shot, and his trainer-brother Dicky (Bale), a one-time up-and-coming fighter who blew it all when he became a crack addict. Those are the broad character strokes that have all the makings to comes together as the kind of uplifting, underdog story that works so well in boxing movies — the down-and-outer (Bale) spiritually “winning” as he gives it his all so another person (in this case, his brother) can achieve his own victory. For added flavor, throw in the brothers’ all-too-real, foul-mouthed mother-manager (Leo) and a local barmaid love interest (the adorable Amy Adams, Leap Year), and the film’s admittedly quite hard to resist. And with Russell’s keen eye for detail, carefully choreographed shaky-cam filming and command over his cast’s performances (which could have easily gone over-the-top), it all works. Not that you haven’t seen this kind of story before. The Blu-ray disc’s specs are all on-target — Lowell’s drab colors and textures are well-captured, as are the town’s wide range of sounds, be they in the gym, a crackhouse, or a local bar. There are a good number of bonus features on hand, beginning with a commentary by director Russell. Though he’s low-key in his delivery, Russell is thoroughly engaging and and informative, showing as much enthusiasm about discussing the technical aspects of the movie as he is about voicing his positive feelings regarding the Eklunds (who served as consultants and are included in the bonus features). Other extras include a 30-minute making-of featurette that offers interviews with the cast, crew and Eklund brothers, and a deleted scenes collection that can be viewed with an optional commentary by Russell.